When Is A Good Time For Move Up Buyers To Sell? You knew it would happen when you bought your home: you outgrew it. Now that there isn’t enough space you need to sell and move up. As they say, timing is everything and real estate is no different. 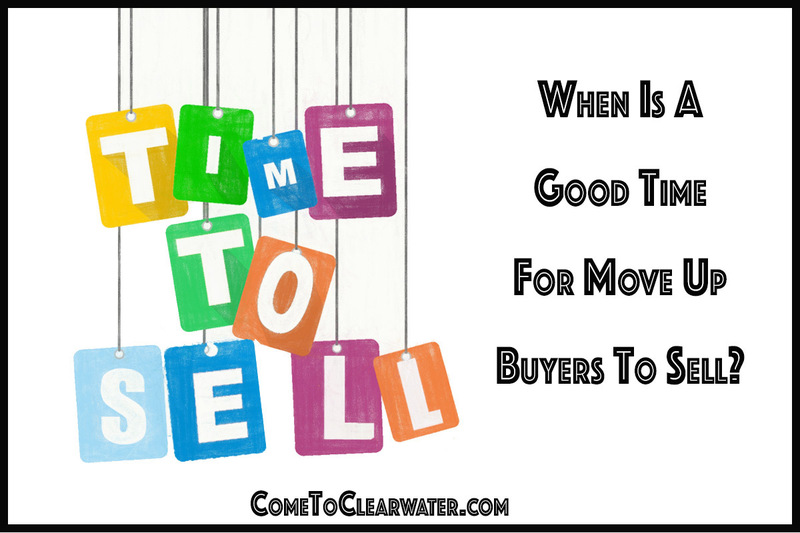 So when is the best time to sell so you can make that move? There are no absolutes, of course, but generalizations can show trends. It’s generally accepted that spring is the best time to list to sell. It’s a statistical fact that 50-60% of homes are sold during the summer. Let’s explore some of the reasons that Realtors say makes spring and summer the best time to sell. Spring is such a lovely time of year. The grass and trees are green, flowers grow and bloom. Your yard looks better, green and lush. The cold winter warms into a beautiful spring, short days get longer. Let’s not forget that buyers come out in droves to find a new home. There are many factors that contribute to this. One is just the fact that winter is over and like the growing plants, it’s time for something new. Who wouldn’t want to move out of a small apartment and have a home that they can plant, decorate and treat as their own? Longer days mean more time to look and let’s not forget that those new smaller families are looking to buy and move during the school break so the kids don’t have a huge disruption in their education. They want their kids to have some time during the summer to start new friendships before heading back to the classroom. It’s also much easier to move when it’s warm! If someone is coming from a cold climate north of Florida, they sure don’t want to be moving in the snow! So what does that mean for you, the seller? Let’s start with a bigger chunk of cash in your bank account. It seems like it’s counterintuitive that high supply will end in higher prices. Economics 101 says that shouldn’t be the case. Economics 101 would be wrong when talking about real estate. The reason for this is that demand is also high during this season. In other words, since there are more buyers with demands for the supply of homes, that supply is actually considered less, even though there are more than other seasons. That also means that you can ask for more than you would be able to in other times of the year. Those higher price tags will mean that your home will appraise for more too. How that works is that a home appraiser looks for homes that are comparable to yours. If those homes sold for more, your home will appraise for more as well. Being that there are more sales, there are more homes to compare. In other seasons when the sales are fewer, there are fewer homes to use in a comparable. In other words, more data from more homes is much better for you, the seller. Did I mention bidding wars? Yes, with all those buyers looking, your chances of having a few bidding for your home at the same time is higher. Multiple offers mean more money for you, and less headaches due to buyer demands. Demands for what, you ask? Repairs, concessions in price or requests for help paying closing costs, and contingencies for financing. A cleaner sale is a faster sale, so that will give you the time and money you need to buy your next home. Which leads to your last reason that spring is a good time to sell and move up… selling in the spring or summer means you are looking in the late summer or fall, when it is much better for you to be a buyer. Situate yourself to be in the best position to both sell for the most and buy for the best price. It’s about strategy!